Tomato sauce is used as a base for many dishes, including pasta, soups, pizza and Mexican foods. Tins and jars of tomato sauce line grocery store shelves, but making sauce from fresh tomatoes gives the finished product a more intense tomato flavor. Making your own sauce with fresh tomatoes also enables you to control the ingredients and avoid any additives or preservatives. Prepping your tomatoes to make the sauce won't take too much time or effort. Choose the tomatoes you want to use for your sauce. 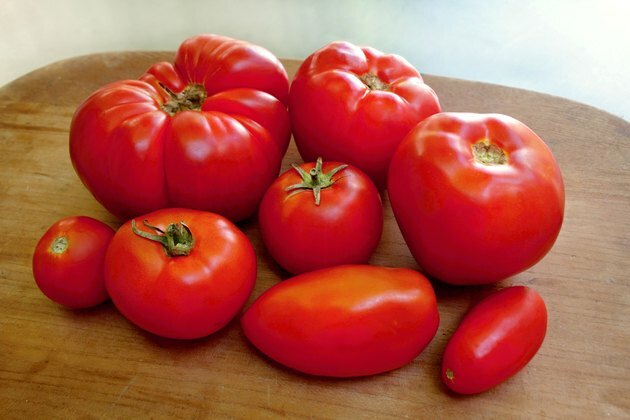 Smaller tomatoes such as roma often have a more intense flavor. Wash your tomatoes in cool water, and then cut an "X" into the bottom of each tomato with a sharp knife. Bring a saucepan of water to a boil, and add ice cold water to a large mixing bowl. Add the tomatoes to the boiling water and leave them for 30 seconds to loosen up the outer skin. Remove the tomatoes from the pot and place them immediately into the cold water to stop the cooking process. Insert a paring knife into the top of the tomato and make a circular cut to remove the core. Gently peel the skin off, careful not to damage the tomato flesh. Add the tomatoes to a pot and cook them down with ingredients such as minced onion and garlic and fresh basil. Alternately, add the tomatoes with other fresh ingredients to a blender and puree into a sauce before heating. How Do I Make Homemade Tomato Juice Using a Juicer?